Avila Beach Condo For Rent: Take a Short Walk to the Sand and Pier From This 2 Bedroom, 2 Bath Condo Townhome, 200 Yards to Beach, Many Amenities. 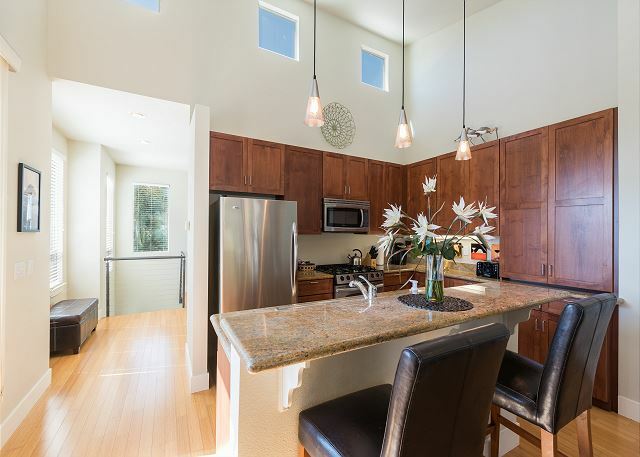 Sleeps 8, Gourmet Kitchen, Vaulted Ceilings, Large Windows, Deck Condo Rental Location: Avila Beach, California, Central Coast Fully furnished and equipped with amenities for your visit. Condo shows pride of ownership, new 2 bedroom, 2 bath town home 200 yards from the beach on a quiet street. This front end, corner unit has large windows that face towards the beach bringing in the beautiful sun and fresh sea air. 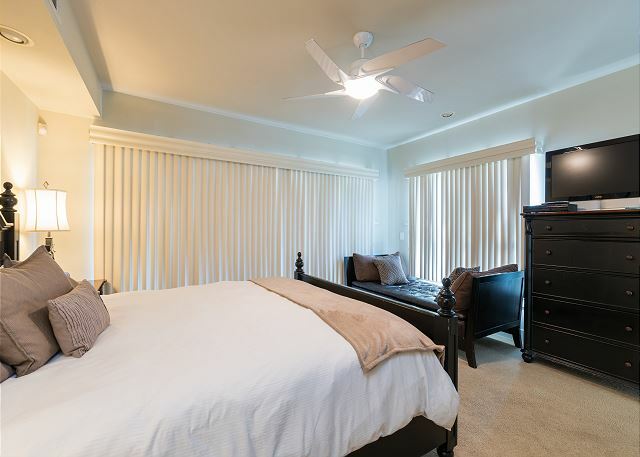 Three ceiling fans move air softly throughout the rooms. Beds for 7 with an additional day bed in master bedroom suitable for a child or teen. Fully equipped kitchen with stainless steel appliances, and granite countertops. Be sure to bring your coffee pods to use in the Keurig coffee maker. Cookware, dinnerware and dishes included The living room has amazing vaulted ceilings, flat screen TV with DVD, expanded cable and DVR, gas fireplace, and a brand new American Leather Queen sofa sleeper. Additional brand new twin American Leather Sofa sleeper in the living room. American Leather Sleeper Sofas are known as 'the worlds most comfortable sofa sleeper." Dining table seats 6 with two additional seats at the bar. Master bedroom has a king bed and day bed (great for a child to sleep on). It also comes with flat screen TV and newly installed room darkening shades. The Second bedroom has a queen bed. Bedrooms have high end sheets, bed pads and pillows along with five star white duvet covers and shams. 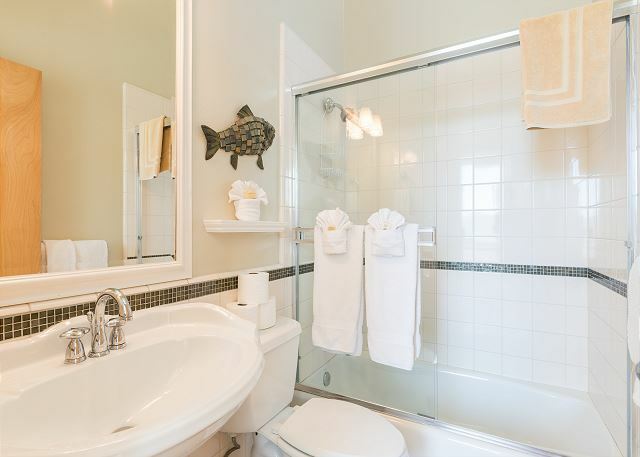 Luxury towels and a Jacuzzi tub in the beautiful bathrooms. Bed and bath linens included Fine art throughout adds to your vacation enjoyment. The condo comes with a washer, dryer, vacuum, and additional fans. Beautiful deck off of the living room with a brand new Weber grill. 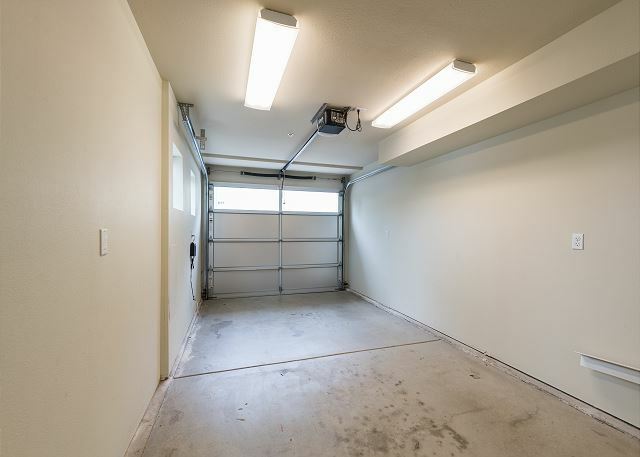 Private garage parking stocked with beach chairs, sand toys and a Pack and Play. We strive to make our condo the nicest, most trouble free and perhaps best value in Avila. This property does not have air conditioning. "Nice place, very easy to walk down to the beach front. Enjoyed the Farmer's Market and Avila." 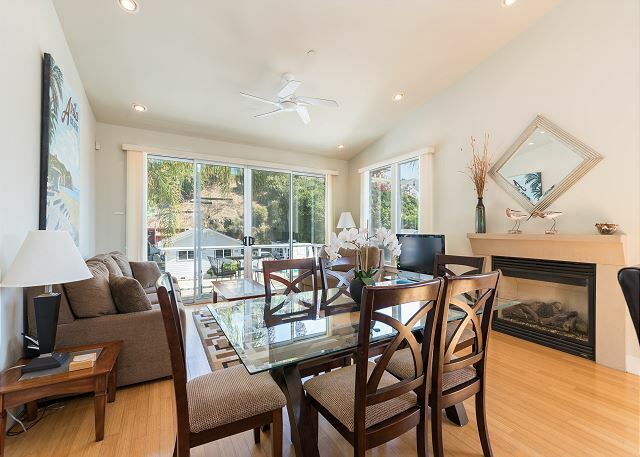 "Great Location in Quiet Avila Beach. Very relaxing, four adults very comfortable. Walking distance to restaurants, shops, beach & small grocery store. A few minor items were wonky, or broken, but it didn't impact our stay. Beware, San Miguel is one of three streets into town, so there is traffic all day long. It did not affect our stay. Loved all the hummingbirds that visited the Balcony to rest, clean & preen!" "We had very good experience with the rental. Place is very clean. Kitchen just great! You have everything what you need. You feel like you at home. Will come back again. " "This is our second time at this property but certainly not our last. Such a nice place with everything you need. Beds are super comfy . Kitchen is very well stocked. Overall just a great unit." "Enjoyed the condo amenities, and close proximity to our work and the beach. Thanks to the crew at Vacation Rentals for responding to our needs. Congrats to the owners. No major issues. Thanks again!" "We were very pleased with this property selection. Home was perfect as far as layout with privacy of bedroom location. Parking was great with the extra security of a garage. Home had everything we would need for comfort. Location perfect only a couple blocks from beach and restaurants. Would book this property again." "The place was clean, very modern and had all the amenities one could want. Location was perfect could walk to our events, restaurant and shopping. Unfortunately we came when it was very hot and there was no air conditioning so the first night was a little uncomfortable since it hadn't been aired out recently. A few minor things didn't work but hopefully they will fix them since I gave them a list. Also there were some safety issues with steps but we survived. Would recommend this company to others." "My family enjoyed our stay here at this town home . Very clean and the location was a very short walk down to the beach! The only thing I would say it's not a baby friendly place ! So don't forget your baby gates ! ;) we will definitely be keeping this place in mind for next year ! " "We had a wedding to attend in SLO and staying in Avila Beach made it easy." "Good location, walk to beach in a few minutes, large space for family fun. Go mid week to avoid noise from traffic on roads"
"This is our 3rd time renting this condo in Avila Beach. Need I say more. Perfect location for all members of the family. Short walk to the beach, park and wine tasting. Try and be there on a Friday for the Farmer's Market." "Great location. Very clean and inviting. Perfect for our long weekend get away"
"Pleasant stay by the beach would highly recommend to others"
"Very nice place. Would suggest a sign posted near entrance from garage to,home that warns renter of step up and step down. The current build out can be hazardous and cause potential falls. Overall a wonderful place to rent with the touches of home. Very reasonably priced, and located near the center hub of the beach life. Would definitely rent the unit again." "Would absolutely use VRBO/Coastal Vacation Rentals again. Far more personal than a hotel. This property was really cute, bigger than we thought it would be, open concept, very bright & sunny! The beds were comfortable, all the creature comforts were included. Lot's of quality in this place. My only compliant is noise. Mainly on the weekend evenings. Lot's of loud traffic noise from the party goers, etc. It's location to downtown & the beach is perfect. No need to drive anywhere. I would recommend this condo to anyone wanting to visit Avila! " " I had a wonderful experience I would do it again." "We stayed at 215 San Miguel. Beautiful property and a large, very clean unit. My family and I attended at wedding in Avila Beach and needed a place that would sleep 5 comfortably. I was impressed! Close to the beach, just a block away. You do need to drive to Pismo Beach to pick up and drop off tbe keys. Not too much of an inconvenience, there is a wonderful grocery store to stock up on your food and incidentals. Coastal Vacation Rental was very pleasant to work with and I would definitely stay again!" "It was a special couple of days as it was our twins 2 year olds first time at the beach. The rental's location and overall quality aided in the positive experience." "Very nice condo with very well stocked kitchen. Only a short walk to the beach. Only complaint would be the noisy street, especially in the early morning hours. So don't expect to sleep in." "Our Family are second timers to this beach condo. We were here last year and, the San Miguel condo, got a two thumbs up for a return trip this year!! Great location, easy walk to Bob Jones Trail, beach, park and Avila Village." "Beautiful Avila Beach Condo. Perfect for families. Kitchen comes complete with everything needed to cook. Location is perfect for a beach getaway week. Highly recommend." "This place is spectacular! Even better than described! Very clean and high end. All the comforts of home! I will definitely book this condo again on my next trip to SLO." "I searched for some time to find a condo that could comfortably sleep five guys. This worked great thanks to the two sleeper sofas in the living room. The unit looked new, was well stocked and served our needs perfectly as we came into town to ride the Giro Della Costa Centrale. Some small complaints were brought to managements attention upon key drop off, but nothing major. A very comfortable place to stay." "It was lovely. Avila is a sweet spot. The apartment was light, breezy and well situated. We really enjoyed having the doors and windows open all day and night. Kitchen, lounge, bedrooms etc were all really comfortable and well looked after." "Condos were great! Clean, updated,well stocked. We had a wonderful time! It was unusually hot on the weekend that we were there so this may not apply -but a few small fans for the bedrooms would have helped. No other complaints. We loved the beach, food, farm,& fun!!" "Our family members coming in for a wedding enjoyed the location and the units." 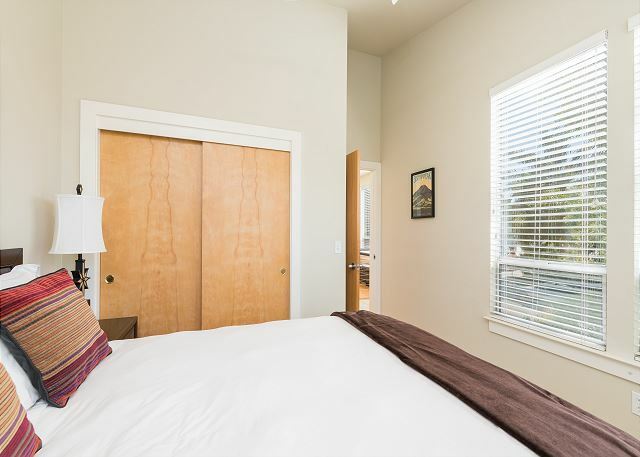 "Great rental--this is our fourth stay in this complex. Some minor issues (kitchen faucet dripped, master bath sink had a slow drain), but for the most part the stay is always excellent. Best deal in Avila Beach!" Response from Coastal Vacation Rentals: I am sorry you had these problems. In the future please call us we can take care of it immediately. Thank you for staying with us, we look forward to your return. "thanks for a great week." "This place is amazing!!! Lighting and space was perfect!!! I had my photographer take our before pictures there because the natural lighting was amazing and there was more then enough room for everything "
"In the future, we would seriously consider renting this condo again! Easy walk to park, beach, water front, wine tasting rooms, walking trail, etc. The place was clean and ample room for the 8 of us. Easy check in and check out. Office staff answered my questions with courtesy. Thanks!" "The pictures of this rental don't do it justice! It was beautiful and comfortable, very spacious for 6 adults. We were able to walk to the beach and shops in 5 minutes and there was parking for both of our cars. We hope to stay again in the future! " "The property description was accurate and the condo was clean and very well-maintained. The customer service was excellent, and I would recommend the property to a friend. For me the main attraction of the rental was the beach, ocean, and the stream at the far end of the beach, as I am a biologist and always loved the ocean. Other "attractions" and restaurants were average. I had hoped for a better bookstore among the stores, but it's probably the best one could expect for such a small town. I was there for a wedding, and that above all was the main attraction of this trip." "We rented this vacation property to attend my daughter's graduation at Cal Poly SLO. The property management team was courteous and very helpful. We arrived after the "worst" storm the hit California in a decade and the Avila Beach area had a power outage. I called the Property Manager and was told the power will be up in a couple of hours and it was. We also had some issues with internet access and they were able to resolve that within a few hours. We were able to host a very enjoyable graduation party at the property. The property was located a couple of blocks from the beach. We walked around the shops and watched the sunset. There's a couple of cafes at the beach; we had coffee and pastry and watched the surfers. The property itself was beautiful, clean and spacious. The home décor was beautiful and the owner's art displays were conversation pieces. We would definitely rent this property again if we are in the area." "Nice condo with a convenient location. Coastal Vacation staff was always friendly on the phone and helpful with my questions." "Loved this property! The downstairs master suite was huge with a huge bathroom and closet. Also had a little chaise/day bed that our toddler son slept on. Upstairs living room/dining room/kitchen area was open and inviting with a fireplace that actually warmed the room. Upstairs bedroom was also a nice size. So nice to be able to to walk the couple blocks into town and to the beach and back throughout the day and also have a lot more space than a hotel room. We loved the wine tasting rooms in town, Custom House was yummy, and Doc Burnsteins ice cream at the Hula Hut. Definitely would stay here again." "We had a great time. Condo very clean, well supplied. My kids say they want to come back every year!" "This is a perfect location, near the beach but very quiet and good for a family. The beach is not too crowded especially when we were here in both June and September. Instructions for the condo and check-out are clear." "We look forward to returning." "This condo has everything top of the line. From the furnishings to the linens to the GREAT beds everything is first class . If you forgot something no worries this unit probably has it. The location is so close to everything once you park in the garage there is no need to move your car. The property management company is so easy to work with. We defiantly will be back. Thanks for a great stay. "Great property! Clean, bright and airy, with everything my family needed for a long weekend. My dad loved the luxurious master suite! Easy walk to the beach and just a couple of blocks to the Custom House. The management company was great to deal with." "Avila Beach is always a wonderful place to stay, any time of the year. This was the first time that we've rented a property there, and we were very happy with the experience. The people that we interacted with were fantastic, and were able to work with some of our unique requests. The location was very good - within easy walking distance of the town/beach, including the variety of shops and eating options. The property was beautiful and accommodated our guests well." "I would not change a thing- townhouse was awesome! " "The home was very nice and walking distance to town and beach. Ample room for 2 adults and 2 teens. Quiet and safe. Nice there is a garage for security but super small, so I parked on the street when I can and that was fine. The only constructive feedback was that there was no shampoo/conditioner in the master bath. I would certainly stay there again!" "Our stay was perfect! Our rental was very spacious, clean, short walk to beach... we did end up eating in quite a bit so would have been nice to have foil, plastic wrap, baggies, but other than that, terrific! Plus, beautiful weather... What more could you ask? ...we'll be back! :)"
"We rented the unit for a family wedding and had a wonderful place to hang and catch up with friends. 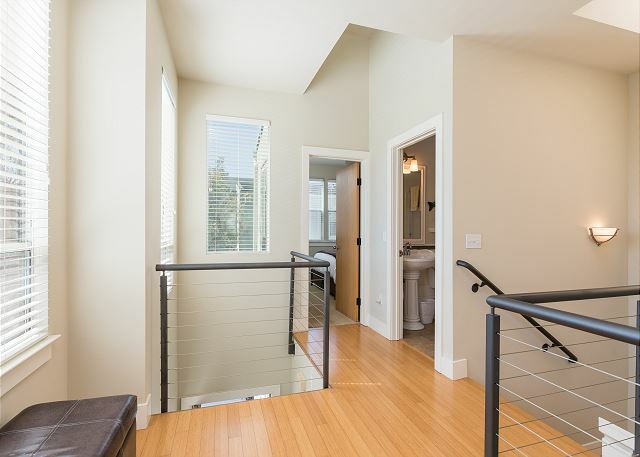 Beautifully done townhome with all the amenities you would need. Some street noise but other than that 10 out of 10!" "We rented the place for a wedding weekend. The place was clean and nicely decorated. The only issue I encountered is that there were no basic cleaning supplies in the unit to keep the condo clean the few days we were there. The location was great!" "Great location in Avila, very short walk to all amenities and the beach. Was stocked with everything you need, will return, thanks"
"Lovely accommodations, much more spacious than anticipated. " "Close to the beach, very quiet, comfortable. Dining table for 6. " "We had a great experience, nice place, very clean. The only issue was the propane tank for the BBQ was empty other than that no complaints." "clean, walkable to beach, comfortable"
"We had an amazing time! Can't wait to return to Avila Beach! Home was clean and new. Perfectly situated near the beach and within close walking distance to EVERYTYING. Coastal Vacation Rentals was extremely accomoadating and very professional. " "We were very pleased with the location of the condo. 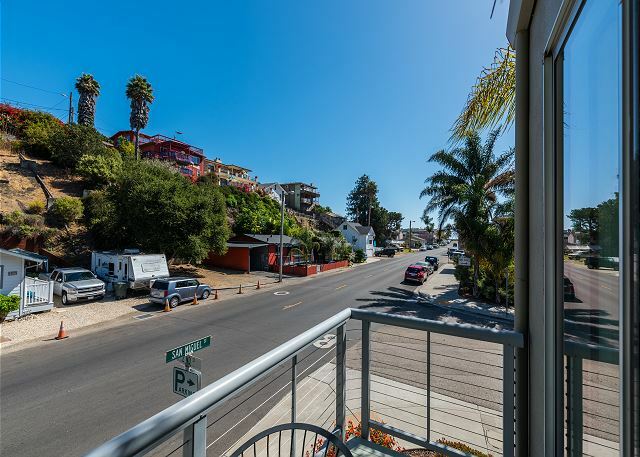 Only 2 blocks to the beach and shops! The condo was comfortabe, clean and nicely decorated. Perfect for our family of four. My only suggestion would be to have some cleaning products on site to clean the counters and glass kitchen table. Maybe add a few more kitchen items such as foil, plastic wrap, etc. for guests to use. We would definetely come back to stay at 215 San Miguel!!" "We stayed in rental for 2 months and it was just a delight. The unit was great and only 2 blocks from the beach. This enhance our stay as on nice days (we were there mid winter) as we could walk to the beach for dinner or just a stroll. It was a great experience!" "The place met all our expectations and had all the amenities you would need in a home. Very clean and homely. The beach was just a short walk up the street. The only thing we would suggest is to have a full roll of toilet paper and paper towels available. Overall, we enjoyed the home and would definitely come back again in the future! " 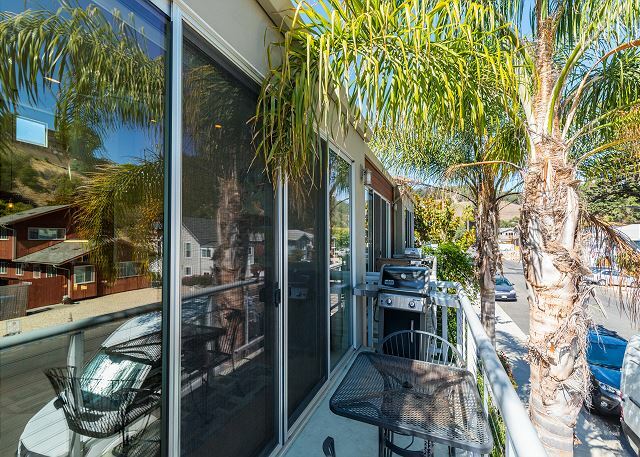 "We were very happy with our rental in Avila Beach, the location is ideal and we loved the layout of the condo, it was clean and very well maintained. The only suggestions I would make is the couch in the living room be replaced, it's the main piece of furniture and is worn and not comfortable at all and the glass supply be increased. There was plenty of wine glasses, just not enough regular drinking glasses." Response from Coastal Vacation Rentals: New owners have replaced both sofas with top of the line American Leather Sleeper sofas. Glassware has been restocked, along with other upgrades. "We usually stay in a hotel when we go to Avila, but this time decided to use a condo since we have two teens, and need two rooms. It was the perfect arrangement. The boys had a bedroom and sofa bed upstairs, and their own bathroom. We had the King Master Suite with a wonderful Jacuzzi tub. We appreciated having a gourmet kitchen where I was able to cook a meal, and grill on the barbeque. Overall, an enjoyable experience and we can't wait to go back. " "We really liked the place and overall were very pleased. There are a couple issues that need correcting. The downstairs hot water in the shower, and probably in the washer, is reversed. Turning the water to hot in the shower causes it to be colder. A sign would be helpful. I took a cold shower the first morning before the maintenance man could explain this. Also, the internet does not work in this apartment. I suspect it is the router. No one came to fix it despite our call the first morning. Thanks. " "Nice condo, but needs more basic items, i.e., coffee filters, salt/pepper, dish rags, wash cloths. The washer and dryer did not work correctly. The key pick up and drop off is very inconvenient." "We had stayed here a couple years ago and this time we've noticed a lot of minor issues like fan didn't work in family room, lights out, broken fixtures, broken furniture, etc. It was clean just starting to show it's age." "The wi-fi network was not satisfactory despite more than one attempt to get it fixed. It was out for 5 days of our stay and despite doing what the office personnel told us to do, nothing seemed to help.Also the shower downstairs had the hot and cold water reversed and the washing machine also had hot water on the cold setting and cold water on the hot setting. If it can't be fixed properly, at least a notice should be given so tenants can adjust what they need to do rather than being surprised!!! Clothing could be ruined if the cold cycle yields hot water! The manager was helpful and polite throughout the rental process - it was just the wifi situation that seemed not to have a good solution- maybe not her fault." "This property is on a corner of a fairly busy street, so unfortunately the noise level was higher than expected. Also, the dishes were not clear, a few towels has some stains and the barbeque has not been cleaned or used in ages, it actually had cobwebs." "This is the second time we have rented this property. It is a great location and very close to the beach. The only thing that was not up to par was how clean the unit was compared to the first time we stayed. I found out later when we brought back the keys that we could have called and they would have sent someone over to take care of the cleaning that wasn't properly done. " "No soap in either bathroom. Property manager gave conflicting/incorrect stay estimates initially. So it was confusing." "My family and I had a wonderful stay at the condo at Avila Beach. The property was spotless and it was so convienent to walk to the beach. We will definately be renting this location again in the future." "Very nice and clean property. Walking distance to beach garage parking and two tv's! Only problem is that it is next door to post office and a bit noisy in early am when mail truck arrives. " "We stayed at 215 San Miguel while attending a wedding in Avila Beach. We walked everywhere -- didn't need our car all weekend! Great location, awesome place!" "Great location, great house. Loved the easy access to the beach and to the bike trail. " 2. The property management charges your credit card as soon as you make the reservation (full amount including deposit), and you dont get your deposit back until 10 to 20 days after your stay. I understand these are their rules and policies, but it would be better to the client if they put a hold on the credit card instead of just charging it. "Beautiful and very comfortable house with great amenities and great location! We will be back!"